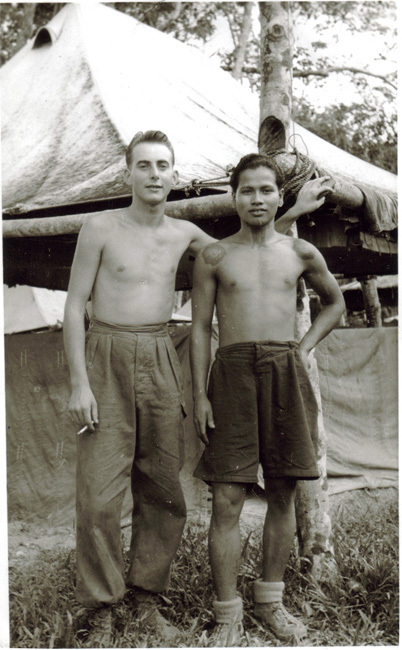 In the mid/late 1950's, a young Andy Nicoll served with B Coy KOSB at Niyor Estate, near Kluang, Malaya. 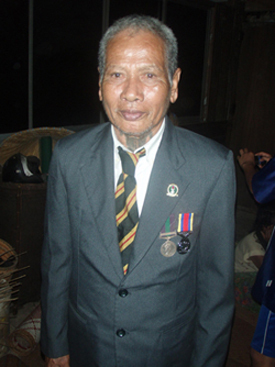 He got to know a young Iban tracker (Sarawak Ranger) who gave his name as Andil. A photograph of Andil and Andy was taken and sent home to Scotland. Some 50 years later, this photograph was put in the Operations on Land memories section of the Fight4thePJM website. "mcdangle" and Andil (Iban tracker), B Company, 1 KOSB, at Niyor Rubber estate, near Kluang, mid/late 1950's. Photograph taken just before the Iban tracker's friend Dempi was killed in a CT ambush. In the early part of 2008, two years after that photo was published here, an intrepid traveller, Stuart Goring, hacked his way deep into the Borneo jungle. 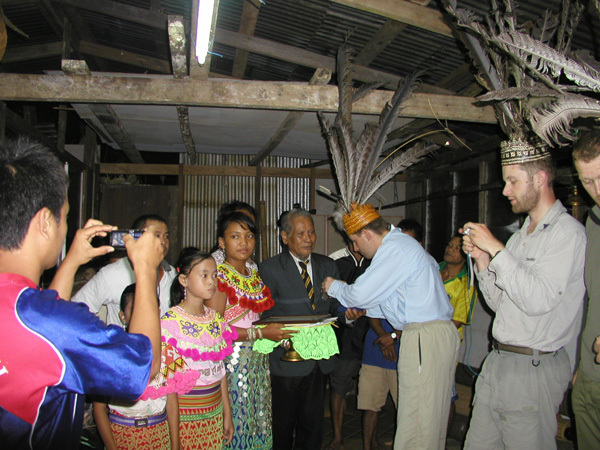 He was returning to visit an Iban he first encountered in Borneo in 2006. 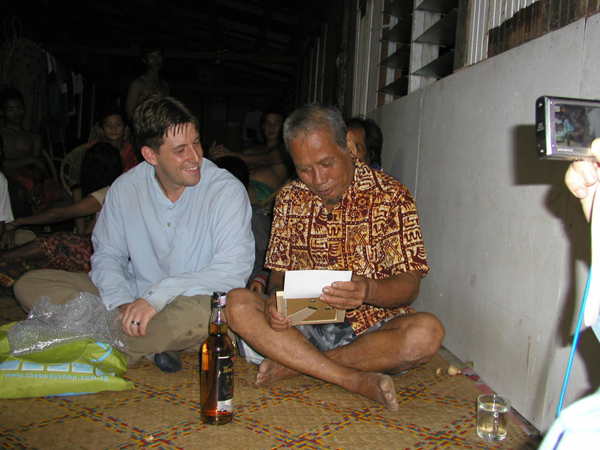 Stuart now returns each year to visit the kampong. 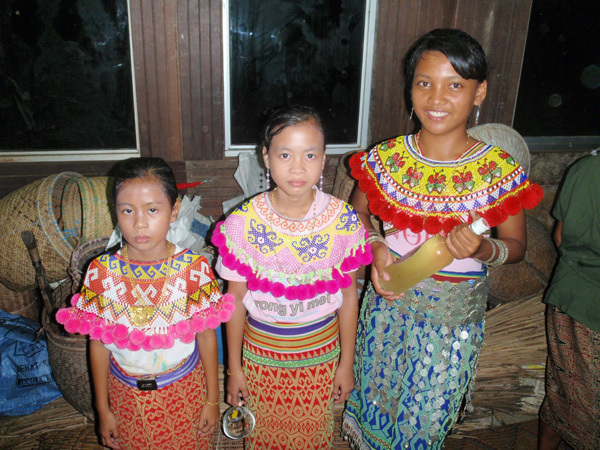 He stays in the Iban’s longhouse and on one visit took some photographs. 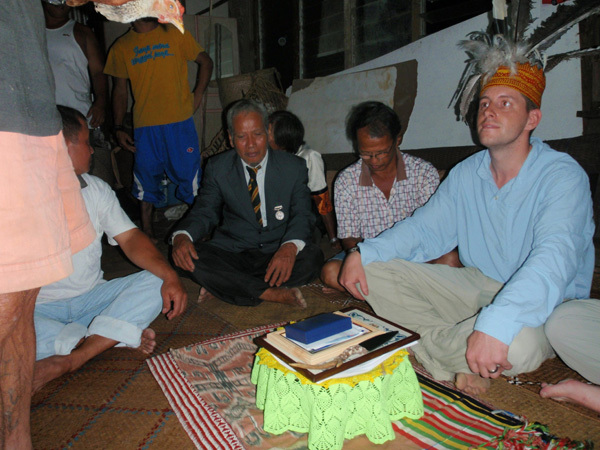 On his return to the UK from Borneo in 2008, Stuart was surfing for images in connection with an unrelated matter when, surprise, surprise, the above image of Andy and Andil appeared on his PC. 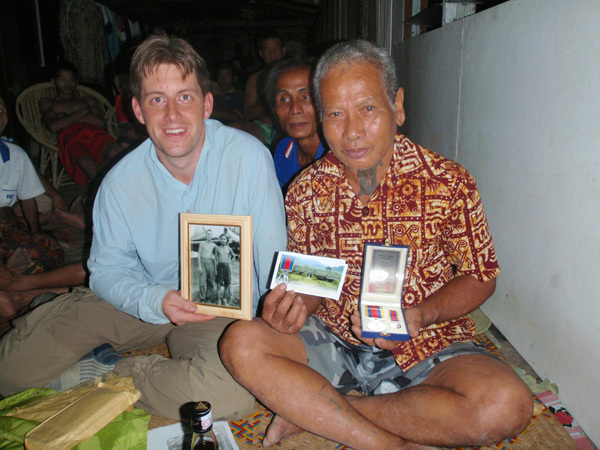 He realised that this was his friend, the Iban he had stayed with in Borneo and so, having read the story behind the 1950's picture, he decided to try and get in touch with the “mcdangle” captioned with Andil in the photograph. We checked and he was eligible. Andil completed an application form (having submitted all his service papers as ‘evidence’). 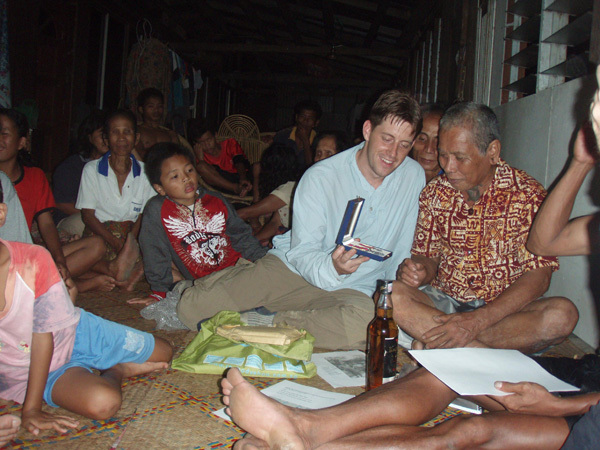 Eventually, with a lot of help from many people, we were able to arrange for Andil’s medal to be taken to Borneo by Stuart on the visit he planned for December 2008. 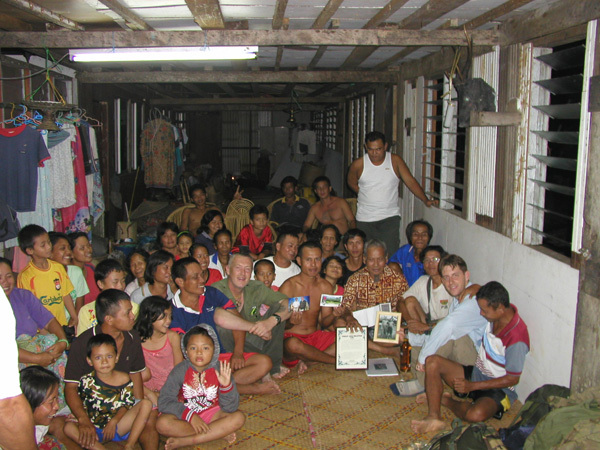 Stuart returned from Borneo in January 2009 with pictures of Andil and his family on the occasion when he was presented with his medal. We understand that this proud man was delighted to be honoured for his services to Malaysia – the following photographs tell the story. Andil sees for the first time the 1950's photograph of himself and "mcdangle". The moment that Andil sees his Pingat Jasa Malaysia for the first time. We arranged for a PJM Citation, engraved with Andil's name, to be sent with the medal - Stuart kindly had it framed. 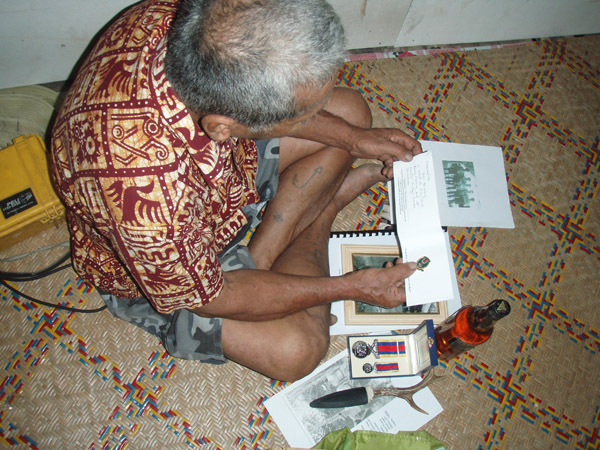 As another gift to his old friend, Andy had sent copies of pages from a book about the KOSB in Malaya. The images would bring back many memories. Andil was also given a Fight4thePJM Lapel Pin (so it's now 32 countries where it's worn). Andil is looking at the F4 presentation card which accompanied the badge - the message on the card says that the badge is sent from all former Malaya Borneo servicemen and women. 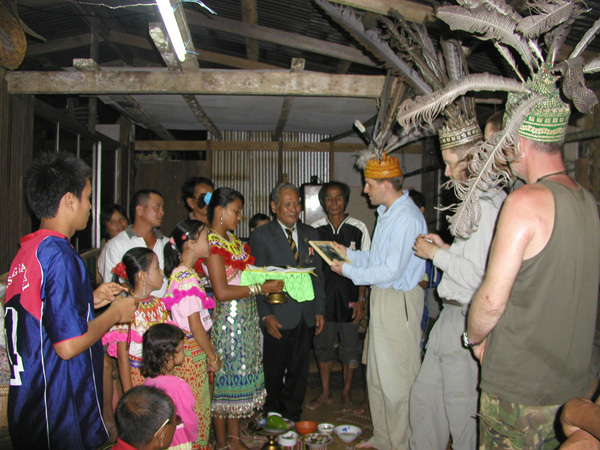 Andil and his family and friends inside their longhouse which is 'under construction' - a very proud moment for everyone. But the presentation of the PJM did not occur until the day after the above photographs were taken. Andil decided that he should wear a jacket so that the PJM could be pinned on and worn alongside his GSM. His family and friends dressed formally for the memorable occasion. The reception party gets younger and younger ! 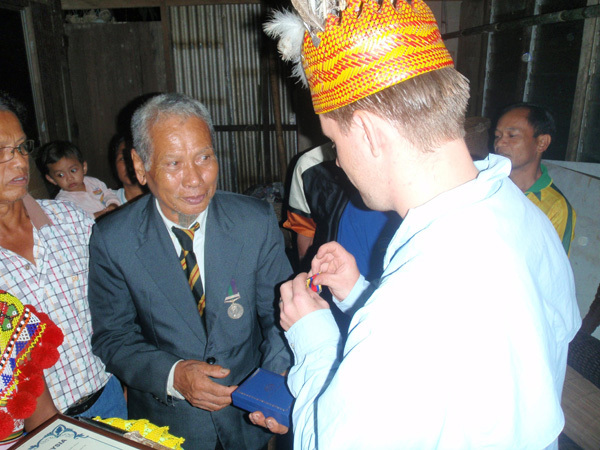 The Medal and gifts receive a blessing from the spirits. Note the chicken in the top left corner - this is bad news for the chicken! The official presentation of the Pingat Jasa Malaysia. Andil's expression says it all. Happily the jacket enables Andil to have his medal pinned on. The official presentation of the Sgian Dubh sent to Andil by his old comrade in arms, Fight4thePJM's very own Andy "mcdangle". 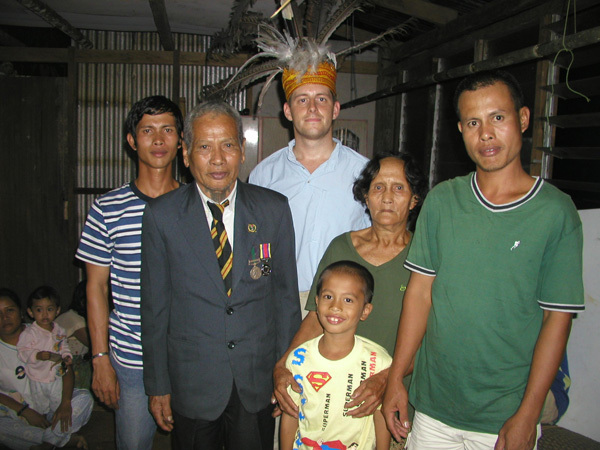 Andil and his Pingat Jasa Malaysia, his wife, and his sons. Andil is now the Headman (that's another story). It was only with the help of such men that Commonwealth forces and Malaysia were able to pull off the only ever success against major terrorism and aggression. Andil and Andy today. They fought together 50 years ago. They lost friends in that fighting. 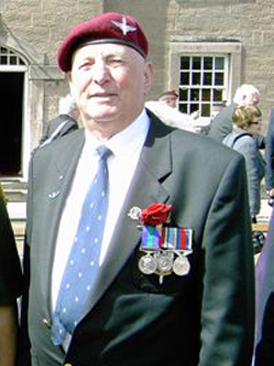 They lost Dempi, one of Andil's tracker comrades serving in Malaya with Andil and Andy's unit, the KOSB. Dempi was killed when taking on some CT attackers. Andil, after the presentation of his PJM, and during the liquid celebration that followed, talked about another Iban tracker (Sarawak Ranger) named Dempi who had been killed whilst on patrol in the jungle with D Company, 1 KOSB. Apparently the patrol's JCLO (a Chinese Civil Liaison Officer) observed fresh human faeces on the track. Dempsi, the KOSB Patrol Commander and a Corporal took over the lead positions of the patrol and advanced in line abreast. Dempi spotted two CT's (communist terrorists) waiting in ambush in a clump of bushes about five yards away and immediately fire a round from his single shot rifle. Andil says that Dempi then charged the two CT's with his parang, albeit that is not in the official report. But it is recorded how Dempi was then shot in the stomach by a CT shotgun and he died of his wounds. The patrol commander and the Corporal fired on the CT's through the ferns, killing both terrorists. Dempi anak Berain is buried in Kranji Military Cemetery, Singapore. Did Dempi charge with his parang? Quite possibly. Having fired his single round, his parang was the only weapon available to him. 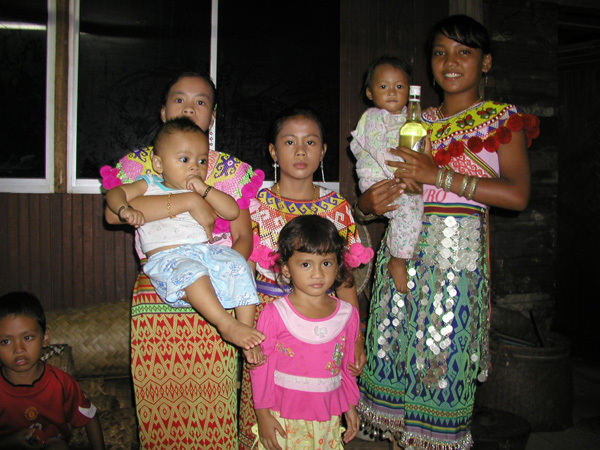 But according to the Iban Andil, there may be another reason. 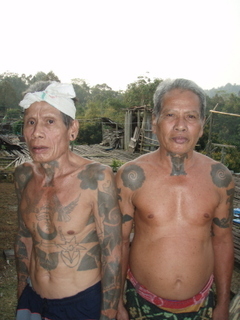 The tattoo awarded to an Iban for 'taking a head' is traditionally a ring around the finger but, in the case of a kill with a rifle, a short line is apparently tattooed on the lower outside portion of the back of the thumb. So perhaps that is another reason why Dempi may have attacked the CT's with his parang. This Fight4thePJM campaign has achieved much over the last four years, but we are especially pleased when we bring old comrades in arms back together again, with their memories. It makes it all worthwhile. And finally, a question from us to the British 'establishment' as represented by the civil servants who manufactured the incongruous PJM Ministerial Statement that has been proved to be flawed both in fact and in law. "Why would you wish to try and engineer a public announcement that withholds from that loyal Iban tracker the Queen's approval to wear the PJM?" Their actions are repugnant to any right thinking person. Andil did his duty - and they reward him by placing a stigma on his honour and on his self esteem. They can send their explanation direct to Andil - he lives here nowadays, without a taxpayer-funded index-linked pension. Actually, without any support from Britain. 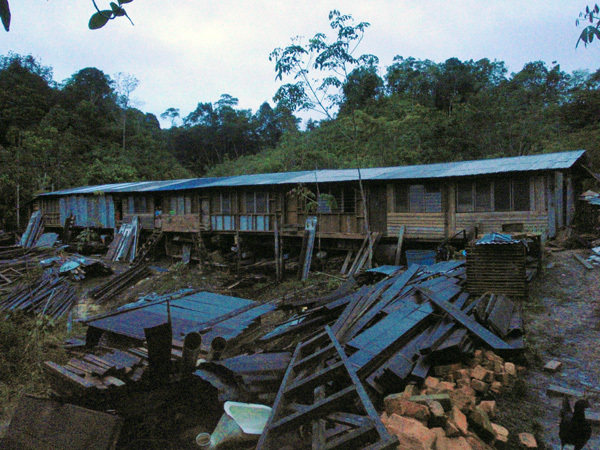 Andil is building this longhouse himself. He is now the headman and will live out his life here, with his wife and family ... with his memories ... and now with his PJM! We would like to thank Stuart for making this memorable occasion possible. 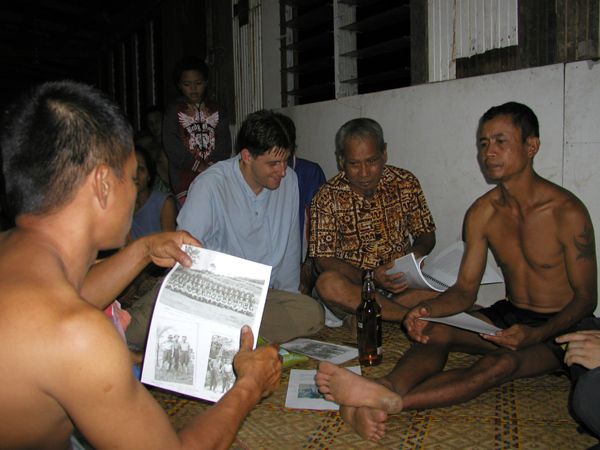 His exploits as an intrepid, independent traveller, and his 'strange coincidence' on his return to the UK, led to ex-Malaya-Borneo men in many countries working together to ensure that Andil received the recognition he so justly deserves. Comment = Two young junior school children from the Manchester area will be especially pleased to read this report about Andil receiving his PJM. And this is why. One evening in September 2008, I (BarryF) returned to the Fight4thePJM office in Manchester and two children were there, Hadrian (aged 10) and his sister Tabitha (aged 9). They were in the office waiting for their mum Wendy who had collected them from school but had had to return to the office to finish work on her key responsibilities, no doubt delayed by helping us on Fight4thePJM matters. 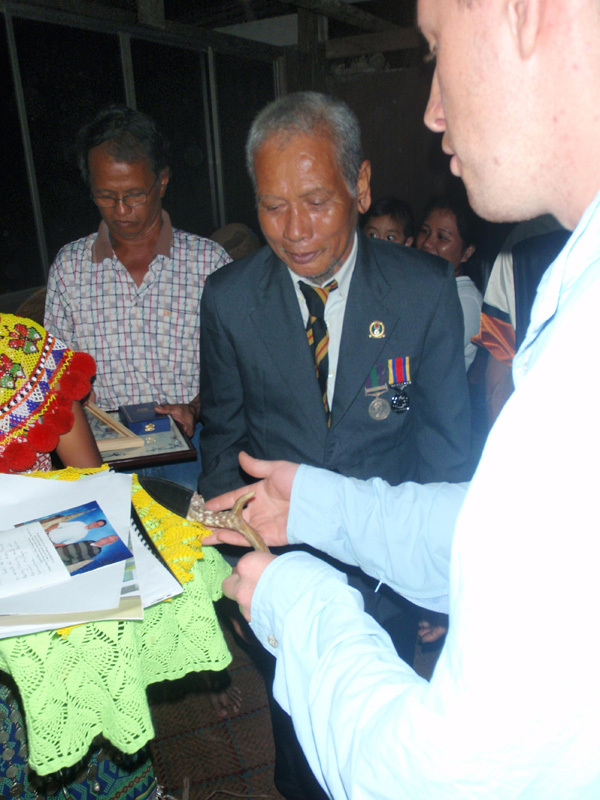 That day I had been to a Malaya-Borneo veterans’ new standard dedication and so was well and truly in PJM mode. While I was chatting to Wendy and her brilliant children, Wendy told me about a presentation that Hadrian, helped by his sister, had given at his school and for which he had received a commendation. Their project was about the PJM. They are very interested in the Malaya-Borneo story and the campaign that is now going on, having picked up all the information when they were visiting our office waiting for their mum. I had absolutely no idea that those two children were going to make a project of the PJM subject and present it at their school. 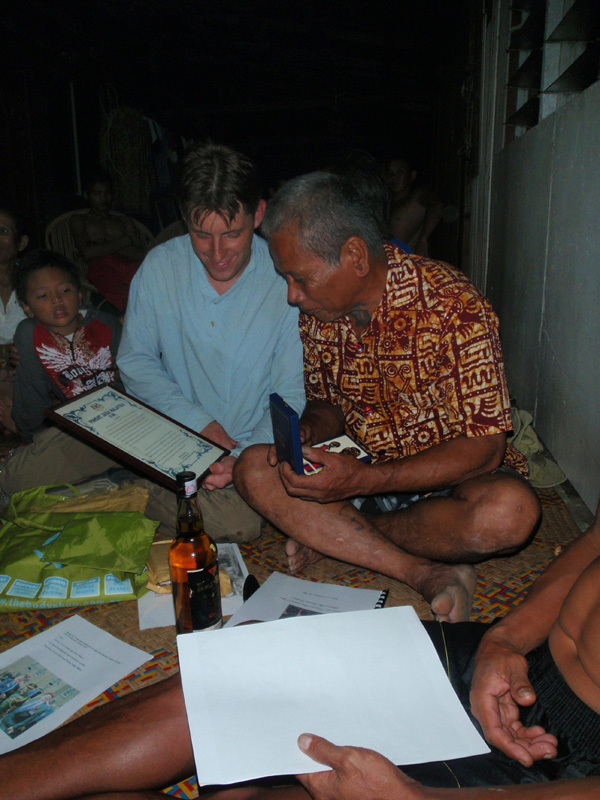 I showed them a PJM and talked about men like Andil who helped us in those far off days in Borneo. 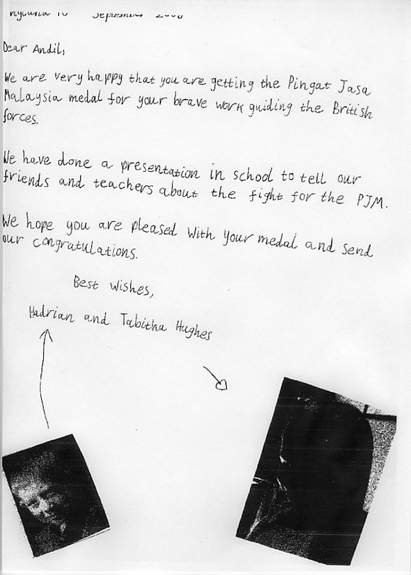 I also presented them with a Fight4thePJM Lapel Pin – they certainly deserved it. What I didn’t know is that that night they went home and wrote a letter to Andil! 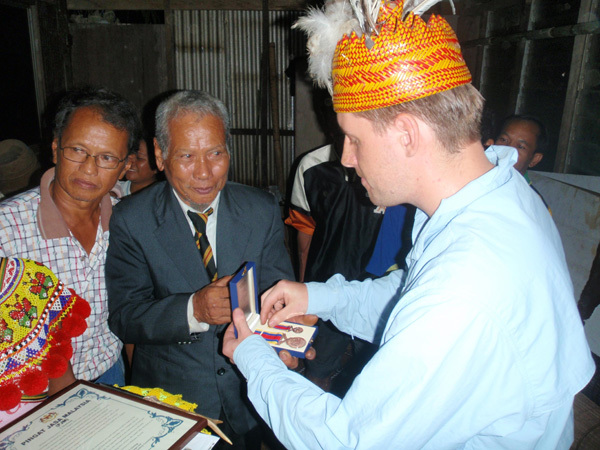 We arranged for letter to be taken by Stuart to Borneo where it was presented to Andil when he received his PJM in his longhouse. I think the letter says it all ... I would have liked to have been a chit-chat on the wall when the letter was translated! Hadrian and Tabitha's letter to Andil.